I almost titled this post "How the Internet Ruined Motherhood" but I decided it's not all negative. I've found some amazing moms all over the globe that are an inspiration. But that's not what this post is going to talk about. I'm gonna talk about the not so fun stuff. The stuff we don't photograph and put on Instagram. First off, let's just admit, no one is as perfect as their Instagram feed or Facebook page seems. These are forums to share beautiful moments of our lives that we want to remember but it can stress a mommy out --- when your having an off day, you take a break at nap time to check Instagram and everyone else has posted perfect children all morning. Second of all, there is blog after blog, after blog turned book, that talks about how to raise your kids without yelling, or how to raise a grateful child, or how to deal with tantrums, and suddenly you think everyone else has found the secret sauce! Everyone but you. Third, you immediately go to Pinterest to save one of these articles and it recommends 20 others. I know, I do it! And your caught in an endless cycle where all the moms on the Internet are perfect. Except you. And while, yes I have found some great advice on the Internet, I have also tried things only to have my child still yell and scream at me. Even when I'm being calm and loving as possible. But guess what? My children are almost 3 and 1 and 1/2. So yah, they have some intense feelings and emotions. There are a handful of moms that share the truthful side of things too. One of my favorites is renegade mothering. She is definitely worth checking out if you haven't already. So, I am taking a step back and a page from her book. Sometimes I might yell. Sometimes I apologize to my kids for my behavior. Sometimes I say things I shouldn't in front of the kids. Sometimes I cry. 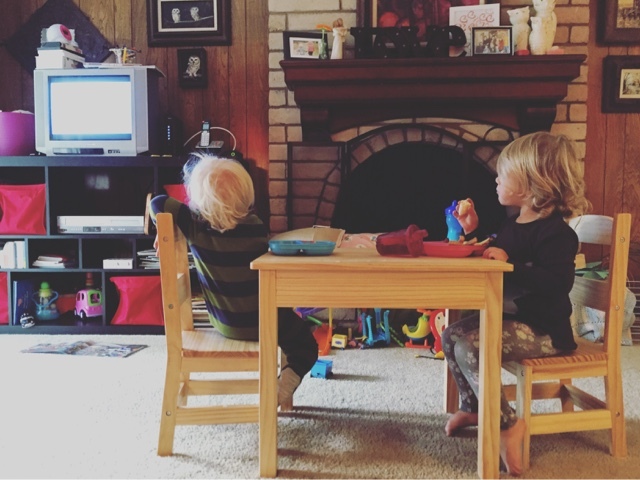 Sometimes my house is a mess and the kids watch too much TV. And today, I'm sharing the above picture to prove it. Let's call it #imperfectmotherhood - because that is what it is. So my new rule of thumb: if your trying to be the best mom you can be - then you are succeeding. Because all we can do is try. Yay, us! And if you're interested in seeing more real life of the Martin bunch... Follow me on Snapchat: emartini68.